It has been a real hot minute since I've sat down to write a blog post. I've decided to try my hand at sharing about home decor and renovations since that is our life right now. We bought a house in June and have been busy making it just the way we want it. I never thought I would be the person to remodel a home but when buying a house, you have to figure out what matters the most since you can't have it all. We chose location and saw the potential the home had. It had just enough character for me and is just the right size for our family. First of all, we probably would have never attempted any of this without the help and support of my Father-In-Law. He has been a tremendous help throughout everything and has made it so much more affordable because he's shown us there are some things you can do for yourself! My jaw literally dropped pulling up this old before photo. I felt like we were living in a mess for a long time and just wanted it to be finished. The backsplash was a terrible shiny aluminum held up by a sticker backing. 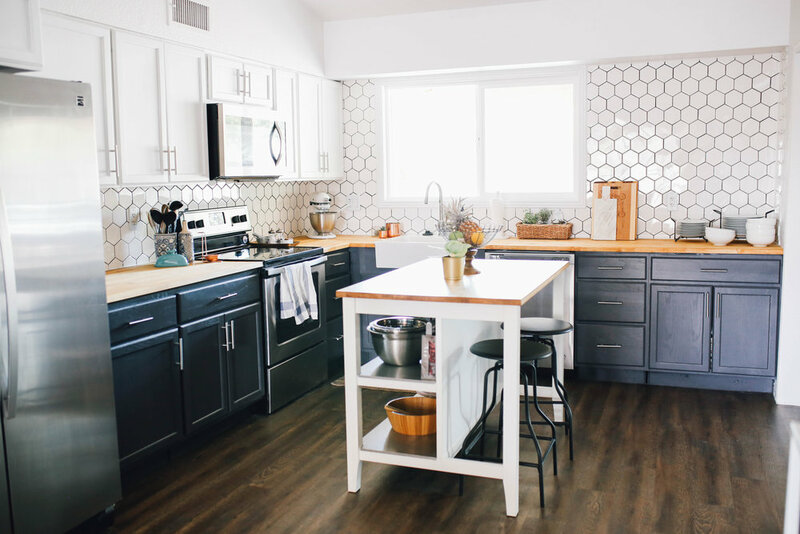 The sink and faucet was black and uninviting, the cabinets were painted black, and the counters looked as though they were pieced together from scraps. We painted and ripped out the counters right away. 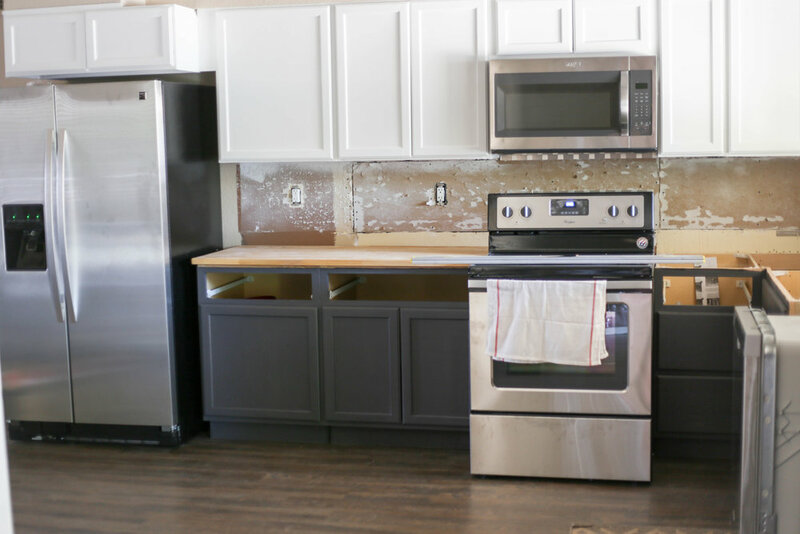 I do wish we would have waited to paint because I had to do some touch-ups myself, (if you need a painter, I have a guy recommended from our amazing realtor) but it was the first glimpse of what the kitchen could look like! I also had to sell the idea of wanting two colors for the cabinets but the hubby liked it eventually. Our counters are from Ikea. I never really thought about having butcher block counters but the more I thought about it, the more I liked it. In the end, I really think the colors work so well together and it's pretty hard to ruin them. You just have to sand them down a tad and oil them back to new. Also, you can't go wrong with new counters under $500! We also picked up the sink and faucet from Ikea as well. I put the handles on myself and I had no idea how expensive they were... I was able to grab a bag of handles in bulk off Amazon and saved so much money. The only thing we have left are the open shelves! You can see where we pulled out some cabinets and made room for where they will go. I'll give an update when those get put in. But my goodness, what a difference this kitchen is! I am so in love with it. My husband installed the backsplash, he says I picked the hardest tile to install, but I'm so glad he did it! It looks amaaaazing especially with the dark grout. He had never installed tile before and although it was a battle at times, he got it done! It's something I can look at and am so proud of him for doing. The island is from Ikea and stools from Target. I have to say, Ikea might get a bad rap for some of their cheaper items, but they really do have some quality ones too! We were able to save a little bit of money and get the look we were wanting. Also pictured below, there's a tall cabinet I found online from Target. We had to figure out a pantry solution since there isn't one currently. That little guy works perfect in that space and hides the side of the fridge that would otherwise be open to the living room.